Foot problems are a common cause of low back pain. 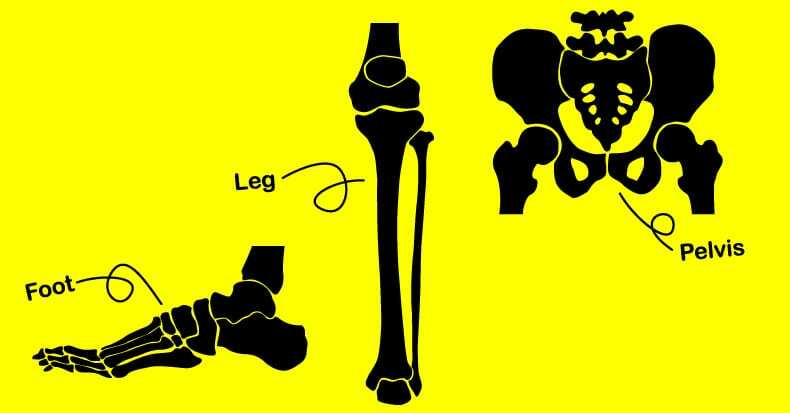 Inequality of the length of the legs is a common cause of low back pain. A pelvis that is not level is a common cause of low back pain. The biomechanics of the low back are intimately linked to the biomechanics of the foot, leg, and pelvis. The actual tissue source for low back pain can be the intervertebral disc, the facet joints, the muscles, the ligaments, the nerves, or a combination of these. Individuals with back pain and their doctors may be tempted to only treat these tissues in the back, yet often the stresses in these tissues are caused by biomechanical problems in the feet, legs or pelvis. Failure to assess and manage biomechanical problems of the foot, leg and/or pelvis often results in poor or incomplete clinical outcomes in patients with back pain. The successful mechanical management of low back pain often requires the assessment and management of biomechanical problems of the lower extremity and pelvis because they are linked through the kinetic chain of stance, posture and ambulation. 23% of the soldiers had legs of equal length. 77% of the soldiers had unequal length of their legs. The incidence of limb shortness was nearly equal between the left and right, and the average shortening was slightly more than 7 mm. 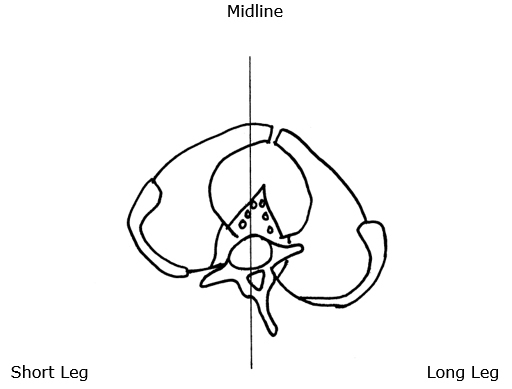 The sacrum is lower on the side of the short leg (left in this drawing). The spinal column initially tilts towards the short leg, then compensates back to the midline as a consequence of contraction of the quadratus lumborum muscle. The lumbar spinous processes (posterior) rotate towards the long leg. The pubic symphysis (anterior) also rotates towards the long leg. The consequent counter-rotational forces abnormally stress the L5 intervertebral disc. Our nation and much of the world recently celebrated the one-hundredth anniversary of the birth of former US president John F. Kennedy (May 29, 1917). President Kennedy suffered from a notorious bad back. His back problems significantly worsened in August of 1943 during the sinking of his boat PT-109 in the Pacific during WWII. Injured (he was awarded the Purple Heart for the event) Kennedy twice swam for miles in the Pacific Ocean, towing an injured crewmember with a life jacket strap in his teeth. Kennedy’s back problems never fully recovered. In 1954, then Senator Kennedy underwent an attempted spinal fusion operation, and it went badly; it was his second spinal surgery for his persistent low back pain. He nearly died, and his recovery took 8 months. The following year, Kennedy came under the care of myofascial pain expert Janet Travell, MD. When Kennedy was elected president of the United States (taking office in 1961), he chose Dr. Travell to be his personal White House Physician. Dr. Travell was the first female physician to hold this prestigious office (2, 3, 4). President Kennedy considered Dr. Travell to be a medical genius (5). Dr. Janet Travell received her MD degree from the Cornell University Medical College in New York City, where she graduated at the head of her class; she was also the first female to graduate from Cornell. For three decades she practiced cardiology while teaching pharmacology at Cornell. By 1952, Dr. Travell’s clinical interest and practice had moved away from cardiology and she became a specialist in musculoskeletal pain syndromes. With her growing positive reputation and expertise, Senator Kennedy’s orthopedic surgeon asked Dr. Travell to look at his patient’s chronic, disabling back problems (5). A difference in the length of the lower limbs. A long second metatarsal or a short first metatarsal (Morton’s Toe). It has been documented since 1946 that about 75% of people have legs of unequal lengths, and that about a third of people have leg length differences that can perpetuate trigger points (1). 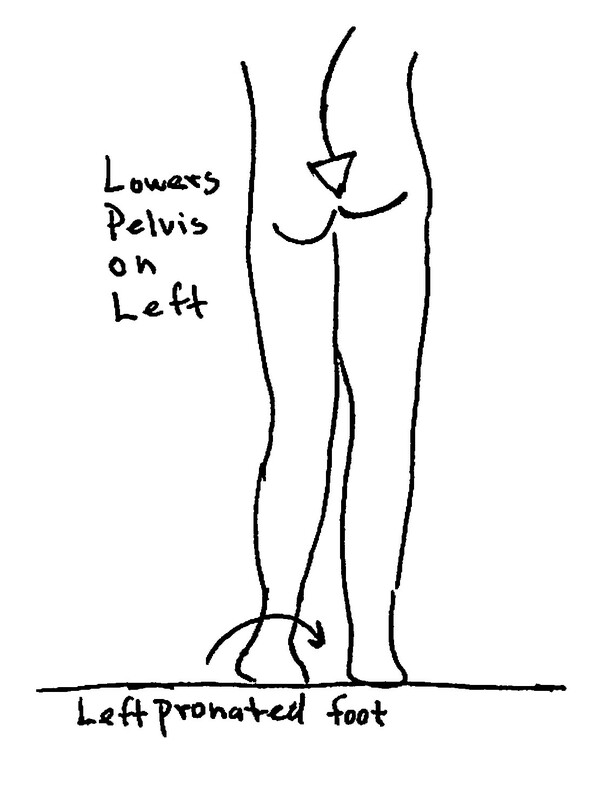 As a rule, the sacrum is lower on the side of the short leg (see drawing). The spinal column initially tilts towards the short leg, then compensates back to the midline as a consequence of chronic contraction of the quadratus lumborum muscle. According to Dr. Travell, the resulting trigger points in the quadratus lumborum muscle is a very common but frequently overlooked cause of chronic low back pain (8). The Morton’s Toe was described by American orthopedic surgeon Dudley J. Morton, MD, from Yale, in 1927 (10). Dr. Morton noted that people suffered from a variety of chronic pain syndromes when they had a long second metatarsal or a short first metatarsal (which he termed Morton’s Toe). This common anatomic variant would alter the normal weight-bearing function of the foot, causing a compensatory pronation. Travell observed that this would lower the pelvis on that side, creating the identical trigger points as a leg length inequality. Dr. Travell notes that the solution is a proper heel lift if the leg was anatomically short, and a shoe orthotic that re-establishes foot mechanics and weight-bearing, usually by correcting the pronation. She notes that other causes of foot pronation can and should be similarly addressed with an orthotic. This concept of a pronated foot lowering the pelvis on the same side, altering lumbar spine biomechanics has been confirmed in more recent publications, including sports medicine reference books authored by podiatrists (11). The intervertebral disc has two components. The center of the disc is called the Nucleus Pulposus, or simply nucleus. The nucleus is mostly water and functions as a ball bearing, allowing the vertebrae to bend and twist. The nucleus is surrounded by tough outer fibers called the Annulus Fibrosis, or simply annulus. 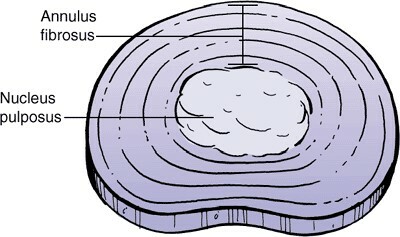 The fibers of the annulus are arranged in layers, and each layer is crossed in opposite directions. During chronic rotational stress on the disc, half of the annular fibers become tense, and the other half become lax. 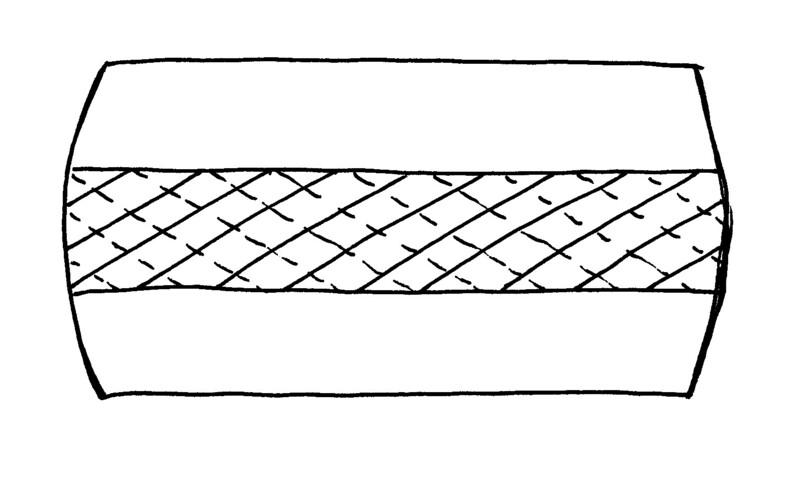 Rotational stress applied to the annulus is resisted by only half of the annular fibers. The disc is operating at only half strength during rotationally applied stress, increasing its vulnerability to injury and degenerative disease. The disc is intolerant to chronic rotational stress (13). In this study by Friberg, standing radiographs of the pelvis and lumbar spine in 288 consecutive patients with chronic low back pain and in 366 asymptomatic controls were exposed. His findings showed that 73% of the subjects assessed had meaningful inequality of a lower limb (>5 mm shortness). The incidence of leg length inequality in LBP patients was significantly higher than in asymptomatic controls (more than twice as much). The L5 spinous process has rotated to the right of midline, towards the side of the long leg. This causes a counterclockwise rotation of the L5 vertebrae and a counterclockwise rotation of the L5-S1 intervertebral disc. The pubic symphysis and pelvis has rotated to the right of midline, also towards the side of the long leg. 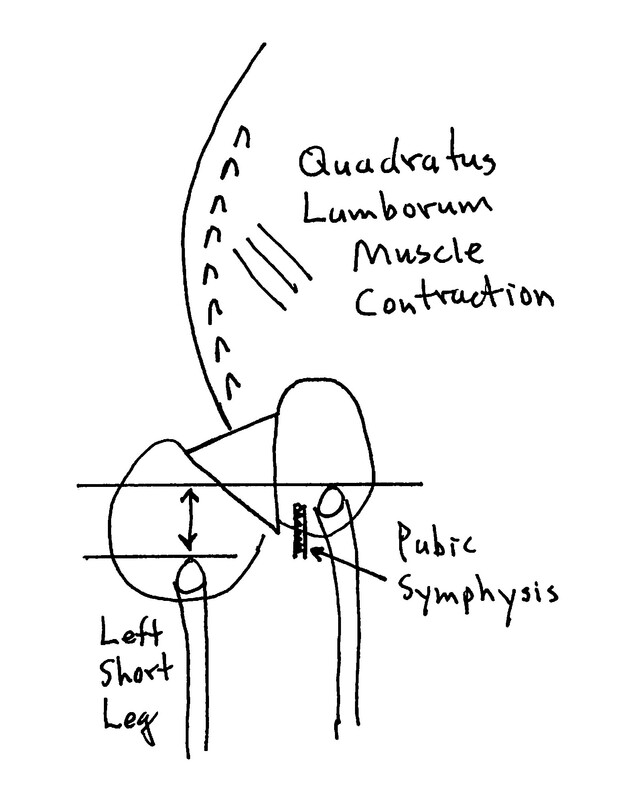 Because the pubic symphysis is in the anterior, this causes a clockwise rotation of the pelvis and sacrum, and a clockwise rotation of the L5-S1 intervertebral disc. These “significant” counter-rotational stresses primarily affect the L5-S1 intervertebral disc. The consequences of these counter-rotational stresses at L5 are accelerated disc degeneration and degradation, back pain and sciatica. The Orthotics Group received custom-made shoe orthotics. Plus Group received custom-made orthotics plus chiropractic manipulation, hot or cold packs, and manual soft tissue massage. The Wait-list Group received no care. These concepts and studies add support for why all people should be evaluated chiropractically for pelvic asymmetry and coronal misalignment; correction of such asymmetries and misalignment may prevent low back pain and disc disease/herniation, and improve surgical outcomes. For individuals suffering from chronic low back pain, the combination of orthotics to improve foot pronation, heel lifts to compensate for anatomical leg length inequality, and chiropractic spinal adjusting (specific manipulations) to the spinal joints appears to be a biologically sound exceptional management approach. Rush WA, Steiner HA; A Study of Lower Extremity Length Inequality; American Journal of Roentgenology and Radium Therapy; Vol. 51; No. 5; November 1946; pp. 616-623. Lacayo R; How Sick Was J.F.K.? ; TIME; November 24, 2002. Altman LK, Purdum TS; In J.F.K. File, Hidden Illness, Pain and Pills; The New York Times; November 17, 2002. Dallek R; The Medical Ordeals of JFK; The Atlantic; December 2002. Wilson V; Janet G. Travell, MD: A Daughter’s Recollection; Texas Heart Institute Journal; 2003; Vol. 30; No. 1; pp. 8ñ12. Bagg JE; The President’s Physician; Texas Heart Institute Journal; 2003; Vol. 30; No. 1; pp. 1ñ2. Travell J, Simons D; Myofascial pain and dysfunction, the trigger point manual; New York: Williams & Wilkins, 1983. Travell J, Simons D; Myofascial pain and dysfunction, the trigger point manual: THE LOWER EXTREMITIES; New York: Williams & Wilkins, 1992. Simons D, Travell J; Travell & Simons’, Myofascial pain and dysfunction, the trigger point manual: Volume 1, Upper Half of Body; Baltimore: Williams & Wilkins, 1999. Morton DJ; METATARSUS ATAVICUS: The Identification of a Distinctive Type of Foot Disorder; J Bone Joint Surg Am, 1927 Jul 01;9(3):531-544. Subotnick SI; Sports Medicine of the Lower Extremity; Churchill Livingstone; 1989. Friberg O; The statics of postural pelvic tilt scoliosis; a radiographic study on 288 consecutive chronic LBP patients; Clinical Biomechanics; Vol. 2; No. 4; November 1987; pp. 211-219. Kapandji IA; The Physiology of the Joints; Volume 3; The Trunk and the Vertebral Column; Churchill Livingstone; 1974. Sicuranza B, Richards J, Tisdall L; The Short Leg Syndrome in Obstetrics and Gynecology; American Journal of Obstetrics and Gynecology; May 15, 1970; Vol. 107; No. 2; pp. 217-219. Giles LG, Taylor JR; Low-back pain associated with leg length inequality; Spine; 1981 Sep-Oct; Vol. 6; No. 5; pp. 510-251. Friberg O; Clinical symptoms and biomechanics of lumbar spine and hip joint in leg length inequality; Spine; 1983 Sep; Vol. 8; No. 6; pp. 643-651. Gofton JP; Persistent Low Back Pain and Leg Length Disparity; Journal of Rheumatology; Vol. 12, No. 4; August 1985; pp. 747-750. Helliwell M; Leg Length Inequality and Low Back Pain; The Practitioner; May 1985; Vol. 229; pp. 483-485. Defrin R, Benyamin SB, Dov Aldubi R, Pick CG; Conservative Correction of Leg-Length Discrepancies of 10 mm or Less for the Relief of Chronic Low Back Pain; Archives of Physical Medicine and Rehabilitation; November 2005; Vol. 86; No. 11; pp. 2075-2080. Golightly YM, Tate JJ, Burns CB, Gross MT; Changes in Pain and Disability Secondary to Shoe Lift Intervention in Subjects With Limb Length Inequality and Chronic Low Back Pain; Journal of Orthopaedic & Sports Physical Therapy; Vol. 37; No. 7; July 2007; pp. 380-388. Balik SM, Kanat A, Erkut A, Ozdemir B, Batcik OE; Inequality in Leg Length is Important for the Understanding of the Pathophysiology of Lumbar Disc Herniation; Journal of Craniovertebral Junction Spine April-June 2016; Vol. 7; No. 2; pp. 87-90. The post The Kinetic Chain appeared first on ChiroTrust.